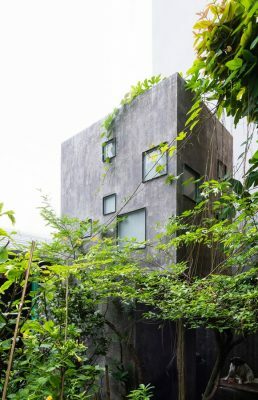 The 2H House was designed for a couple and their 2 little kids, located in Thanh My Loi new urban area in Ho Chi Minh city, Vietnam. Truong An architecture discussed and tried many solutions with an intent hope that we could create a living space that turns toward to not only connecting members of family to each other, but also harmonizing with the natural surroundings. 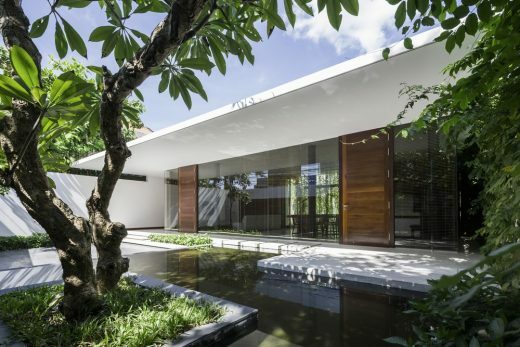 The house, which contains many functions, requires to be flexibly designed. The space is carefully considered to create the inside yard, like “a heart”, that separates function areas by natural factors. Other than that, bringing the sun and the rain into house is so interesting. It really aspired people, gave them effort to work, to play music, to cook, to meet friends and party together. With the requirements to have a house with a slopping roof covered by traditional tiles, we designed the house to show its dynamics and youth inside. 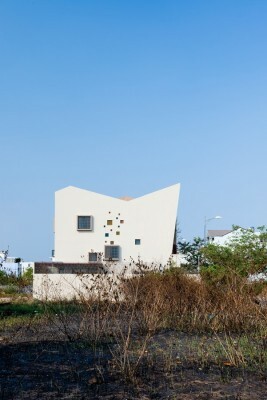 The whole house is proposed as a sculpture. The random layout of colorful glass tiles make the rooms interesting and eye-attracting. The bay window, the oak wood handicraft table and chairs are designed by the natural curves. The light on wooden surface can really bring out a joy, and warm feelings. At night, the house, likes a lantern with yellow light bounce through glass tiles, creates a warm atmosphere for the entire neighborhood. This is also one of the most impressive things in this project.